Written on June 1, 2017, the letter, a copy of which has been forwarded to Counterview, says that they and their children have “no other place to go and live in the severe summer heat and the monsoon rains that would follow soon”. 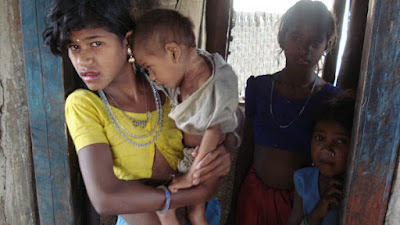 Local sources say, this tribal family is not alone. The grassroots organization Rewanchal Dalit Adivasi Seva Samiti, which has taken up the tribals’ cause, has said that there are at least five villages in the district – Kheraha, Chhipiya, Viduraha, Jiraua and Kota – where the local administration has threatened displacement of tribals. Another local organization, Samaj Chetna Adhikar Manch’s Ram Naresh says, what is particularly strange is, the displacement of Kheraha has been threatened despite the fact the village was established as late as 2010. The tribals who came and began living here were all landless, and the local administration seemed to cooperate. Living on government land, they built huts here, and had applied for land, though a scheduled hearing for providing them land rights never took place. Meanwhile, negotiations were on with the local administration for providing them with land. According to Ram Naresh, while the former Digvijay Singh government of Congress promised to give land to tribals and Dalits, the BJP government of Shivraj Singh Chauhan declared in 2012 that they would be provided with land rights. Chauhan further declared on April 17 this year in Rewa that the tribals would be allocated land in due course of time. “However, now, the tribals are being threatened”, he adds. While the local administration has refused to comment on the development, it claims that houses in these have "illegally come up at several places" and would be "removed" so that the landless people were rehabilitated at one place. The eviction threat comes amidst plans to turn Rewa district into a major power projects hub of Madhya Pradesh, causing problems to thousands of Kol tribals in the region.The tribals are dependent on the jungles for their livelihood. Major companies setting up power projects have already bought up thousands of acres of land in the region, and there is widescale fear that, since the tribals are landless, and are living in misery, they will have to either migrate or face hunger. It is not just the tribals who are being affected by these projects, environment of the region, too, is a victim. According to local sources, Mahua trees are being chopped in large numbers to facilitate the projects. 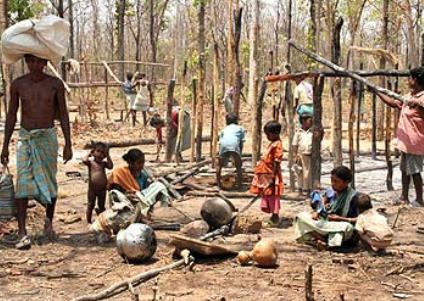 Though living on government land, the tribals are dependent on jungles to make a living.